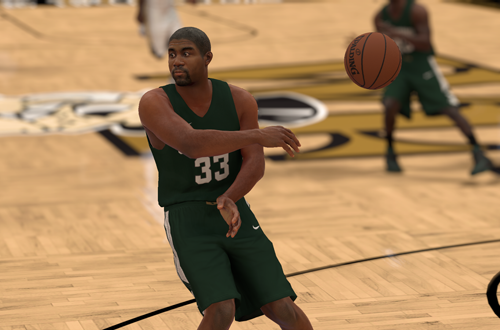 Not unlike the All-Time squads that were introduced for every NBA franchise last year in NBA 2K18, the All-Time College DLC added teams featuring some of the best NBA players in the history of ten colleges. The featured schools were Arizona, Connecticut, Georgetown, Louisville, Illinois, Georgia Tech, Wake Forest, Kansas, Oklahoma, and Michigan State. In other words, the schools that 2K had been able to license for the college portion of MyCAREER. While this obviously excluded schools such as North Carolina, Kentucky, Duke, and all of their famous NBA alumni, several big names and Hall of Famers were featured on the included college teams. Players like Magic Johnson, Tim Duncan, Patrick Ewing, Wilt Chamberlain, Allen Iverson, and Wes Unseld were among the featured Legends. Additionally, players who weren’t featured on any of the historical teams were playable on the college squads, including Danny Manning, Wayman Tisdale, Sleepy Floyd, Kenny Anderson, and Darrell Griffith. Plenty of active players were also featured on the teams, namely Paul Pierce, Chris Bosh, Derrick Williams, Kemba Walker, Andre Drummond, and Chris Paul. All of the teams wore their current Nike uniforms, and there were no classic uniforms available. In short, the All-Time College DLC was fairly straightforward, making use of players and branding that had already been licensed in order to offer up some new content. It was a worthwhile idea, but was it worth the price tag? The teams were available as a bundle for $14.99 USD, which was better value than purchasing them individually for $1.99 apiece. However, that was still around $15 just to add ten teams to the roster. There wasn’t much new content, as most of the players and the team art were in the game already. Furthermore, the DLC didn’t include any additional modes or special challenges. The teams were only available in Play Now, and couldn’t be edited. With that in mind, the All-Time College DLC was a bit of a shameless cash grab on 2K’s part. It’s content that could’ve been included by default, alongside the Euroleague and historical teams. Much like the decision to make the Dream Team a pre-order exclusive when it had been available for everyone in NBA 2K13, it was lacking in goodwill. Had the DLC included a selection of retro jerseys, additional schools that were licensed too late to be included out of the box, or a token challenge mode, it wouldn’t have felt quite as greedy. As it stands, it’s somewhat underwhelming given the price; especially if you don’t buy all the teams as a bundle. At the same time, it was clearly optional content. Gamers who bought NBA 2K17 still received all of the historical and Euroleague teams, which was likely satisfactory for most people. Given the amount of pre-orders, it’s also likely that most gamers didn’t miss out on the Dream Team, either. Although it was charging for content that was already available in some form and should’ve really been included by default, it did deliver what it promised for $15. Given that the unavailability of the NCAA license rules out the possibility of a full college basketball video game for the foreseeable future, it was nice to at least get a taste of one on the current generation. Whether or not it is $15 worth of fun is up to each of us to decide. Issues of price and value aside, it is fun to play with those All-Time College teams. I do feel that it was a good way to give gamers an opportunity to play with a few of the historical players who aren’t available on any of the classic teams, without having to collect them in MyTEAM. There is a certain appeal and novelty to the All-Time College teams, but it does wear off rather quickly, especially since we can’t edit players or move them to other teams. Once you’ve seen who’s on all the squads and played a few games with them, you likely won’t touch them much after that. It’s a shame it wasn’t on PC, too. 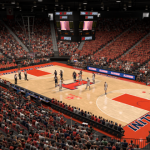 In terms of making in-roads towards a return of college basketball games, the DLC unfortunately hasn’t had much of an effect so far. Aside from not being anywhere near the kind of virtual college hoops experience that gamers really want to see, it doesn’t change the fact that there’s a very delicate issue with the NCAA profiting off student athletes who aren’t making any money during their college careers; or at least, they aren’t legally allowed to, at any rate. There’s a lot to sort out there in terms of profit sharing and licensing before we see any college sports games once again. 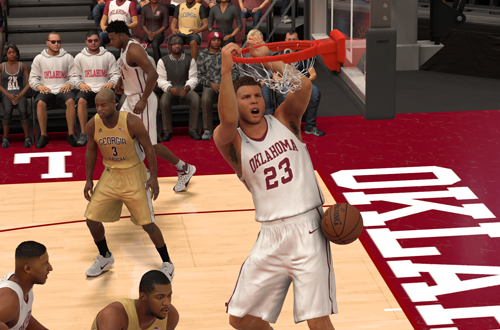 Having a small college presence in NBA 2K16 and NBA 2K17 is about all we can expect. 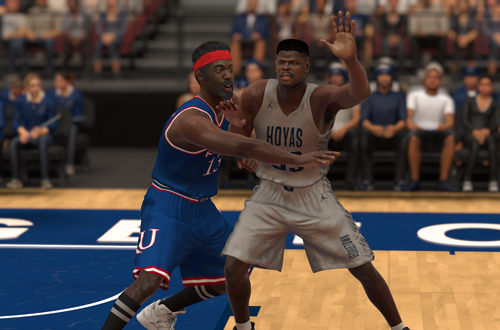 For now, those early stages of MyCAREER in NBA 2K16 and NBA 2K17, along with the All-Time College DLC in the latter, are as close as we’re going to get to a college basketball game on the current generation. To that end, for some gamers the cost of the DLC may be worth it, just to bask in the collegiate atmosphere and play something out of the norm. As for me, I don’t regret picking up the DLC a couple of years ago. I’m something of a completionist, and it still kind of bugs me that I missed out on the Legends Showcase DLC for NBA 2K12. I wanted to make sure that I got the All-Time College DLC, just to check it out and grab it before it’s gone. Looking back at the All-Time College DLC, it has a complicated legacy. It does stand as an example of how DLC can be underwhelming, as well as foreshadowing of what has been a problematic couple of years for NBA 2K as far as goodwill towards the fanbase is concerned. It is also decent content that offers something fun and new, even if it arguably could’ve been more and should’ve been included by default. It is what it is at the end of the day, and if there were gamers who got some enjoyment out of it, it served its purpose. If at some point we can look back and see it as the catalyst for the return of college hoops games, its value will be greater than the original experience.